The Swivel Stonze are the most perfectly camouflaged natural fishing weights available to anglers. They come in a variety of colours, shapes and sizes, so you can always find one that belnds into the background that you are fishing over. The Stonze also make superb method feeders, as the method mix will bind exceptionally well to the naturally pitted surface of the Stonze. The Stonze will also absorb flavours to help attract fish to your hooks bait. These darker almost black Swivel Stonze - or Silties, as they have quickly become known  were sourced and developed with further camouflage in mind when fishing silty or dark bottoms. Silties are slightly denser, but can still be flavoured and used as excellent method feeders, benefiting from all the positive attributes of the original Stonze. Again, each Silt Stonze is unique in shape, size and weight. Available in small, medium and large. Developed for the angler who prefers using an In-line weight system for fishing. The In-line Stonze System will give you all the advantages associated with using a Stonze. The In-line Stonze is an awesome method feeder  able to take on a flavour, with a naturally pitted surface that will really hold the method mix for whatever range. Following the enormous success of The Stonze System, and subsequently the Silt Swivel Stonze and Boulderz, the In-Line Silt Stonze is an obvious and natural progression. The In-Line Silt Stonze benefit from all of the unique and positive attributes of the Stonze System from natural camouflage characteristics through to the obvious environmental benefits. These heavier Stonze were created for the circumstances when that extra weight is needed, e.g. boating out your baits or fast flowing waters. Boulderz still benefit from the overall concept of the Stonze System, just bigger to the naked eye. 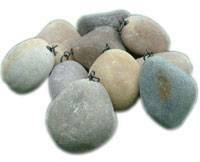 However, to the fish they are merely another stone on the lake or river bed - a 1oz lead weight appears bigger than a 5oz Boulderz, because stone is naturally occurring, whereas lead is not.